13-show pilot, "Beyond the Game," will feature athlete interviews and analysis. ATLANTA, GEORGIA, UNITED STATES, January 15, 2019 /EINPresswire.com/ — GSU and its Creative Media Industries will have a rare opportunity to participate in the production of a new television series hosted by sports commentators Tony Dungy and “JB,” James Brown on February 1-2. 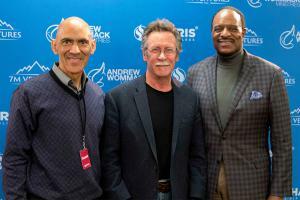 Two-time Super Bowl champion athlete and a coach Tony Dungy is the author of several books on faith and family, as well as an analyst on NBC’s Football Night in America. James Brown, also well-known in the sports industry, is host of The James Brown Show, The NFL Today, and Thursday Night Football on CBS and the NFL Network. The 13-show pilot, Beyond the Game, is conceived for Sunday morning fare and will feature athlete interviews and analysis by these veteran co-hosts. Produced in cooperation with Andrew Wommack Ministries, Inc., headquartered in Woodland Park, Colorado, initial interviews are scheduled February 1-2 around the 2019 Pro Bowl and Super Bowl events, where the best athletes in professional football will be gathered.